ROME — Italy has ordered the seizure of the Aquarius, the rescue ship at the center of international criticism over its government’s hard line against migration, saying the vessel had illegally disposed of potentially infectious waste. Prosecutors in the Sicilian city of Catania announced on Tuesday that they had accused 24 people of having “systematically shared, planned and executed an illegal waste-disposal project of an enormous quantity” in southern Italian ports between January 2017 and May 2018. They said the waste included contaminated garments, leftover food, and medical supplies and syringes. 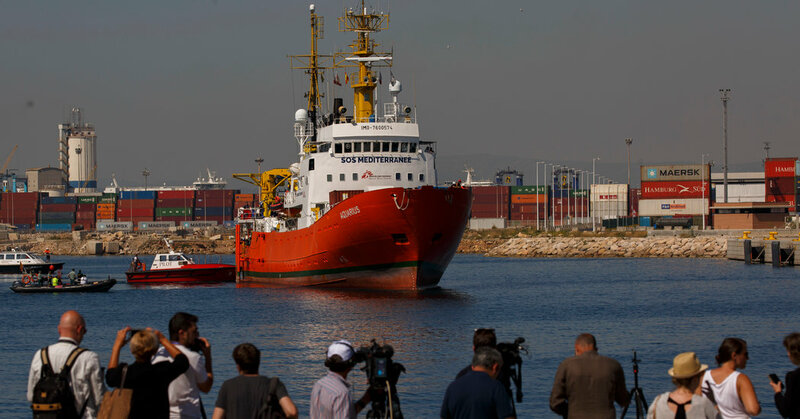 Doctors Without Borders denied the accusation in a statement on Tuesday, writing that it “strongly condemns” the Italian order to seize the Aquarius. It called the measure a disproportionate reaction designed to criminalize humanitarian and medical missions at sea. The group said it would appeal in Italian court. The ship is already idled, sitting in a French port since September because no country has agreed to register it. The Italian order means that if it were to resume operation, it could not enter Italian waters without risk of being impounded. In Italy, the Aquarius has become the symbol of a confrontation between rescue ships, which have saved tens of thousands of shipwrecked migrants attempting to cross the Mediterranean, and government officials who have compared the ships to migrant water-taxis and say they are complicit in human smuggling. On Tuesday, the minister celebrated the order against the Aquarius, and his own actions against nongovernmental organizations that rescue people at sea. Mr. Salvini, whose party rose to power this year on promises to crack down on immigration, has tapped into a deep reserve of frustration and anger on the issue, with many Italians feeling their country has been inundated with arrivals, and left to fend for itself by the European Union. His Security Decree, explicitly tying the safety of Italians to reducing migration, is working its way through the Italian Parliament. This month, he tore down a migrant camp near a Roman train station that opened at the height of the migrant crisis in 2015. He has kept up his hard line against what he has called an “army of fake refugees,” even as he sought to soften his image last week by going to a military airport near Rome to welcome a group of 51 migrants, mostly women with children, evacuated from Libya via Niger by the United Nations refugee agency. “For women and children in difficulty, the only way to arrive is by plane, not by inflatable dinghy, because the dinghies are operated by criminals who in exchange for trafficking in human beings, buy weapons,” Mr. Salvini said. The interior minister has in recent weeks begun to aim most of his rhetorical fire at the European Union, especially as the number of migrant arrivals has plummeted. But Mr. Salvini has given even more authority to the Libyans. Humanitarian groups have decried the larger role for Libya, saying that its treatment of migrants falls far short of acceptable standards. The United Nations refugee agency has noted that while the number of arrivals is way down, people who set out to cross the Mediterranean to Europe have been twice as likely to die in the attempt this year than they were in 2017. The Aquarius had run into several problems since it became the focus of Italy’s ire, including the revocation of its registration by Panama in September. But the announcement on Tuesday that Italy would seize the Aquarius the next time it entered Italian waters constituted a major escalation. The government also seized some Doctors Without Borders bank accounts, the group said. “After two years of judicial investigations, bureaucratic obstacles, disgraceful and never confirmed accusations of collusion with human traffickers, now we have been accused of belonging to a waste trafficking criminal organization,” said Karline Kleijer, who is in charge of emergency services for Doctors Without Borders. The group said that it had always followed standard procedures and that the relevant authorities had never raised any concerns about its practices since it began its missions in 2015. It said it would cooperate fully with Italian authorities. “The only crime we see in the Mediterranean today is the total dismantlement of the search-and-rescue system,” said Gabriele Eminente, the general director of Doctors Without Borders in Italy.